So the Jewish leaders tried all the harder to find a way to kill [Jesus]. For he not only broke the Sabbath, he called God his Father, thereby making himself equal with God. John's Gospel confronts us with a crucial decision: Is Jesus really the Son of God, God with us in human flesh? John paints the story of Jesus so we see that he claims to be God — the "I am" statements ("I am the good shepherd," "I am the resurrection and the life," "I am the bread of life," "I am the light of the world," etc.) tie Jesus to the revelation of Israel's God in Exodus 3, especially Exodus 3:14. Jesus does only what the Father wants him to do. Jesus and the Father are one. If we have seen Jesus, we have seen the Father. While we may not fully grasp what the assertion "Jesus is the Son of God" truly means, Jesus' opponents in his own day did. 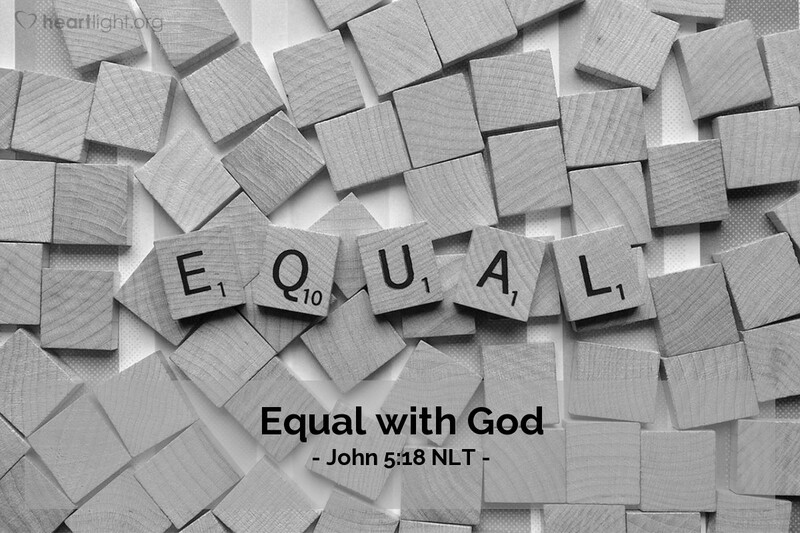 They knew he was making himself equal with God. Their reaction was appropriate for them because they believed Jesus was a blasphemer who must be stopped. Indeed, either he was a delusional power-grabbing religious rebel who must be thwarted, or he is God with us, Immanuel, Son of God, and our great God and Savior Jesus Christ. What is your decision? Father in heaven, thank you for being God come in human flesh. Jesus shows me so much of who you are and how you care about me. Forgive me for the times I have not held you in appropriate reverence. Forgive me for the times that I have robbed your incarnation of its grit and mortality. I confess that I cannot fully comprehend how divine incarnation works, but I do know this, dear Father: I believe that Jesus Christ is your Son and my great God and Savior. In his name, I pray and praise you. Amen.